LASERIUM LASER HOLIDAYS - Celebrate with LASERS! 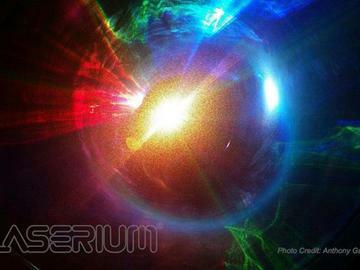 Laser Holidays is a live laser concert performance by LASERIUM. Experience state-of-the-art laser display technologies combined with one-of-a-kind laser visuals from LASERIUM. Laser Holidays is a visual celebration of holiday music of all kinds, from rock and pop, to traditional and adventurous holiday music that the whole family will enjoy. Brilliant laser colors, laser cartoons, and laser projected effects and mid-air laser aerials, exploding in an intimate studio where Laserium was born. Your eyes will say thank you to Laserium's patented color modulation with laser light, and hundreds of special effects! there is nothing like it! Enya, Eurythmics, Mannheim Steamroller, The Ventures, Stevie Wonder, The Drifters, Nutcracker Suite; plus Rockin' Around the Christmas Tree by Ronny Spector / Darlene Love, and Santa Claus Is Coming To Town - Frank Sinatra / Cyndi Lauper. Get ready to experience an amazing and unique experience in Pure Laser Light.